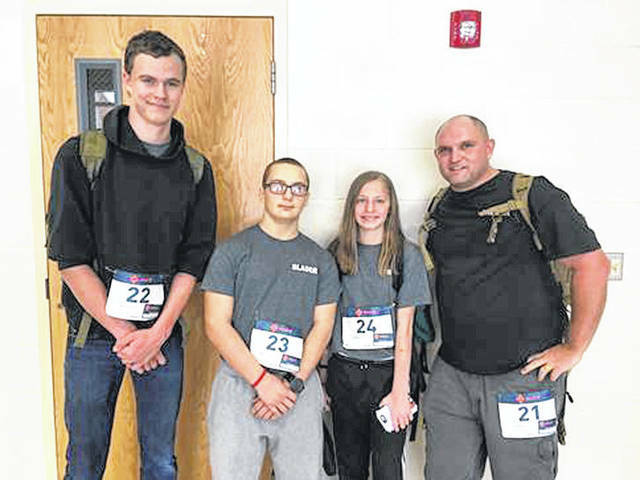 Three members of the Miami Valley Young Marines recently participated in the Bataan Memorial Death March in New Mexico earlier this month. Picture from left is John Sollinger, 18, of Huber Heights, Karl Slader, 15, of Fairborn, Emma Marlow, 13, of Troy, with Unit Commander Keagan Miller of Troy. MIAMI COUNTY — A Troy teen participated in a two-day cross-country journey at the White Sands Missile Range in New Mexico for the annual Bataan Memorial Death March with the Miami Valley Young Marines. Emma Marlow, 13, of Troy, was one of three Miami Valley Young Marines and two adult staff members who traveled to New Mexico for the memorial march on March 17. Marlow participated in the 26.2-mile memorial hike along with other Young Marine members from Wichita, Kansas and El Paso, Texas. Other participants included John Sollinger, 18, of Huber Heights, Karl Slader, 15, of Fairborn and their adult leaders. The actual Bataan Death March consisted of U.S. and Philippine troops who surrendered to the Japanese forces on April 9, 1942 in the Bataan Peninsula on the Philippine island of Luzon during World War II. On that day, 75,000 Filipino and American service members were forced to perform an arduous 65-mile march to their prison camp. They were subjected to intense heat and harsh treatment by the Japanese guards. Thousands died along the route. It is for those that survived or perished on this hike that the memorial hike commemorates, according to the press release. All the members of the Miami Valley Young Marines and the other two units completed the entire hike. For more information, visit www.miamivalleyyoungmarines.com or the national website at www.youngmarines.com. https://www.dailycall.com/wp-content/uploads/sites/30/2019/03/web1_MVMMarch.jpgThree members of the Miami Valley Young Marines recently participated in the Bataan Memorial Death March in New Mexico earlier this month. Picture from left is John Sollinger, 18, of Huber Heights, Karl Slader, 15, of Fairborn, Emma Marlow, 13, of Troy, with Unit Commander Keagan Miller of Troy.